Hi Odette, can you help, pleaase? Okaay, so I got my first pair in August last year, and I loved them! They were 'Grishko 2007' shoes, but recently, they've gotten too small. When I had them, they fit perfectly and felt like slippers (as slipperish as pointe shoes can:L) and was so happy when I got home and was wearing them round the house. Obviously they hurt to start off with because I'd never been en pointe before.. But anyway, so we went to this closer one, and I took my old pointe shoes to show the fitter what make I had before. She told me they only had 'Freed' in that shop. So I tried some on and they felt okaay... She didn't make me go up en pointe, so i was a little worried that they might hurt... But I'm not one to say, so when I got in the car to go home, my mum said "You don't like them do you?" I couldn't say no! I got home and tried to go up, but it hurt way more than when I had got my 1st pair! They even hurt more than my pointe shoes that were too small! I told my mum, and she agreed to take me to to the first place again, but it's not until after my pointe lesson. Also, I am a little bit worries that they may fit me with 'Freed' shoes. Will I be better off with 'Grishko' shoes again? I know this is a little silly, but can you still help? understand how difficult it can be to consistently find the perfect pair of shoes. It sounds as if you get on well with the brand "Grishko", and if this is the shoe you prefer then perhaps carry on wearing these for now. However, it is good to experiment with different brands to see what else is out there. I tried several different brands before finding my perfect pointe shoe. Always remember that each brand of ballet pointe shoes will feel very different. It may be case that "Freed" take longer to break in, so you would need to wear them in more before they begin to feel comfortable. Also, reconsider what padding you wear. As you may find different brands need more or less padding to prevent any pain. New pointe shoes always tend to feel painful at first. Sometimes you have to give them time to soften and mold to your foot. However, you don't want to pain being a result of the shoes being too small, which is why it is so crucial to have the shoes properly fitted. Always make sure you try the shoes on carefully in the shop and go up en pointe to make sure they feel ok. Although, I understand it is often hard to judge a pointe shoe in a shop, as you need to dance in them to know they will be ok. But do not worry, you will gradually become more familiar with fitting pointe shoes. I suggest you stick to what you feel most comfortable with. If it is difficult to get hold of your "Grishko" then perhaps give the other brands another go, but make sure they fit you correctly. When it comes to finding the perfect ballet pointe shoes, it is a just a case of being patient and experimenting with pointe shoes to see which ones are right for you. Join in and write your own page! It's easy to do. How? Simply click here to return to Ballet Pointe Shoes. 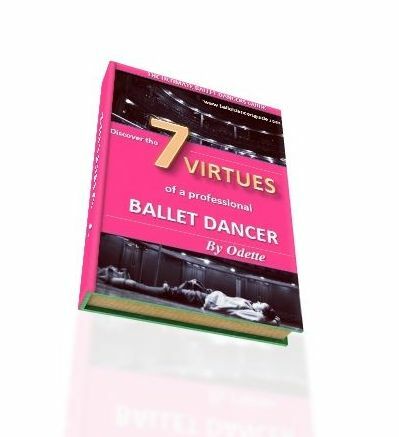 "Seven Secrets to Success in Ballet"
I promise to use it only to send you Team Odette!. "7 Virtues You Need to Become a Professional Ballet Dancer". "You have really inspired me to be MORE determined!" "You are truly the best at giving dance advice." "Thank you for bringing so much "heart" to the dance world." Click here to see more feedback!